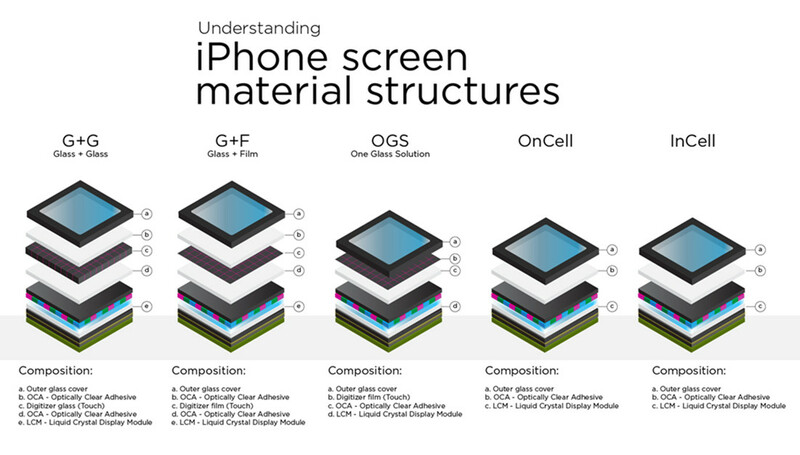 Both G+G and G+F are by far the most common replacement iPhone screen structures. The usage of a digitizer glass instead of film, allows factories to use a high pressure bonding method, which results in a more stable digitizer flex cable, but adds a bit more to the overall thickness of the screen assembly, which can result in the screen being slightly thicker than the chassis. Both G+G and G+F are by far the most common replacement iPhone screen structures. This structure uses digitizer film (typically using a two layer TSP film), which allows the screen to fit flush with the chassis, however requires a low pressure bonding method, which can result in a less stable digitizer. Much thinner than G+G and G+F structures, OGS assemblies often experience stability issues due to the usage of improper equipment and manufacturing techniques. As the digitizer film is not integrated into the LCM, a crack to the outer glass will likely result in loss of digitizer functions. Nearly identical to the InCell structure, OnCell assemblies enjoy both a thin architecture and stable digitizer feature. By integrating a touch screen panel ITO layer within the LCM, the digitizer will continue working even if the outer glass has been broken. As OnCell requires the use of expensive equipment, high quality materials can be expected. This assembly choice has been used on every iPhone until the iPhone X (which uses OLED technology, requiring an OnCell structure. Like the OnCell structure, InCell assemblies are both thin and stable. An integrated touch screen panel within the LCM ensures that the digitizer will function, even if the outside glass is broken. 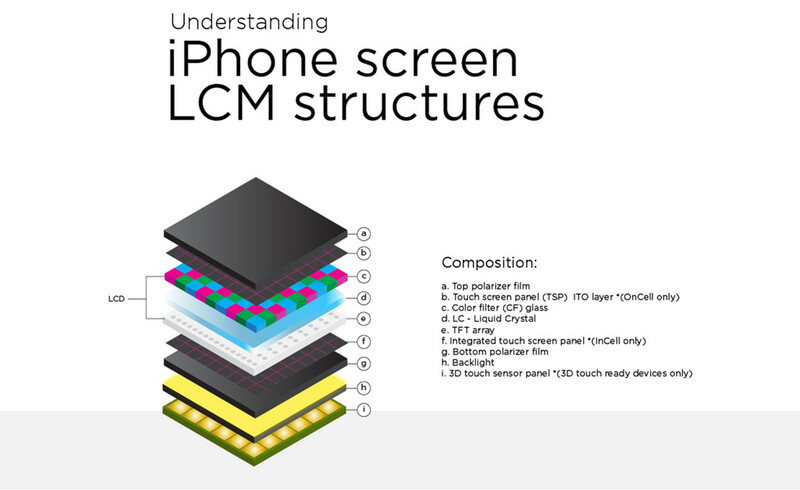 While Liquid Crystal display module (LCM) structures can vary depending on the specific manufacturer, most TFT LCMs contain the same basic components. The top and bottom polarizer is n optical filter and allows you to (among other core benefits) view your screen when wearing polarized sunglasses. The Touch screen panel (TSP) is included in both OnCell (ITO layer) and InCell assemblies (Integrated panel) and is responsible for touch features. The LCD consists of the Color filter, LC and TFT array in order to create the image you see on your screen. The backlight, as the name suggests, creates the light necessary to view your screen and is directly responsible for the brightness and color uniformity of your display. On 3D touch enabled devices, the 3D touch sensor panel is typically included, though software solutions are becoming more common.